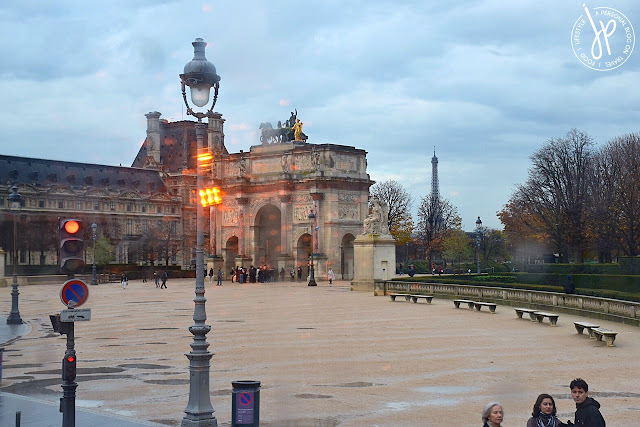 The rain continued on our third day in Paris and I couldn’t be more grateful about hopping on a city tour bus. 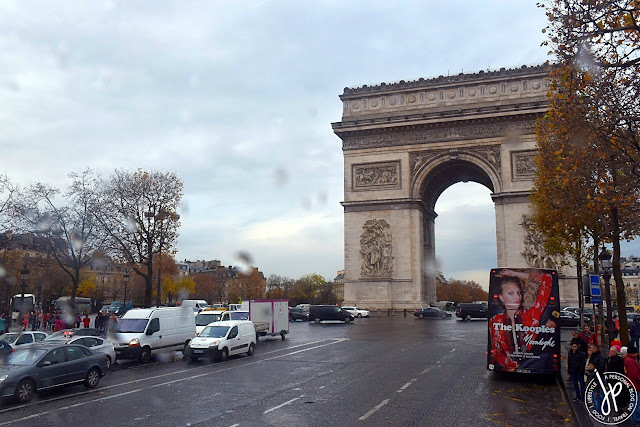 We pre-booked a two-day hop-on, hop-off bus tour on the classic route (red line) before flying to France and on the day of our tour, we went to Big Bus Paris’ Information Centre at Avenue de L'Opéra to have our booking validated. My husband and I planned to finish the entire loop in one go before deciding when and where to hop-off. 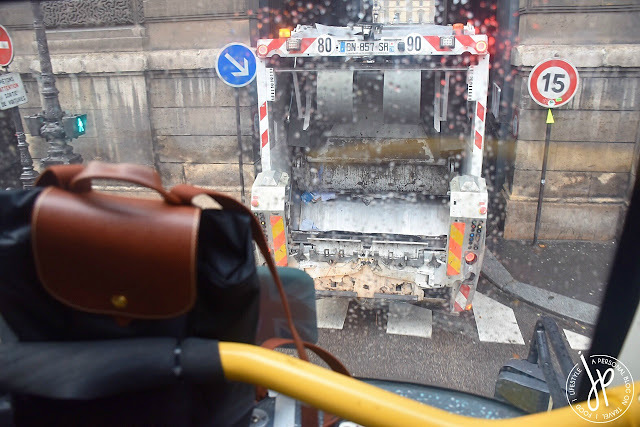 We climbed the steps going to the second floor of the bus and sat at the very front so we can get the best views of Paris (and so that we don’t get wet!). The bus left the office past 9:00 AM and the first stop from the information center was the Louvre Pyramid. 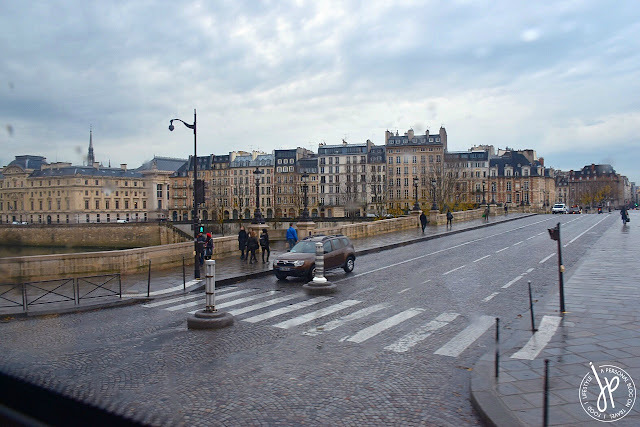 The bus also stopped at Pont des Arts, though we didn’t stay that long as there weren’t any tourists waiting at the bus stop. 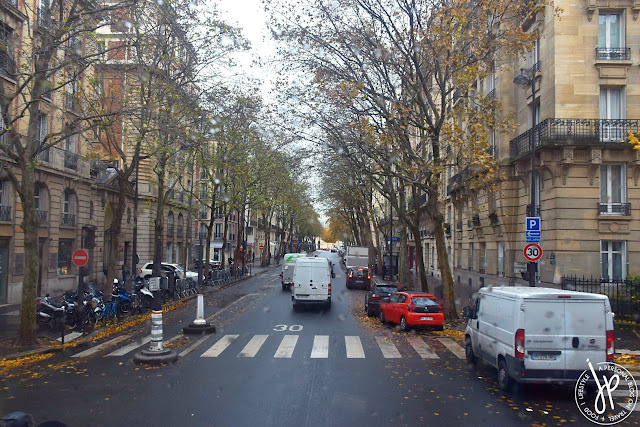 Bus squeezing its way into the narrow road going to the Louvre! Big Bus drivers are very well trained and the audio guide mentions this, too! We continued onto Notre-Dame Cathedral and this was one of the stops where the bus took some time to pick-up passengers. 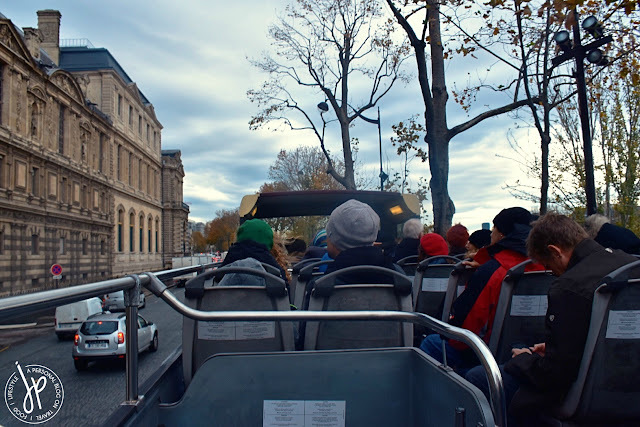 I didn’t find the tour boring because every seat was equipped with an English and European languages audio guide. Disposable earphones were available at the bus’ entrance door. 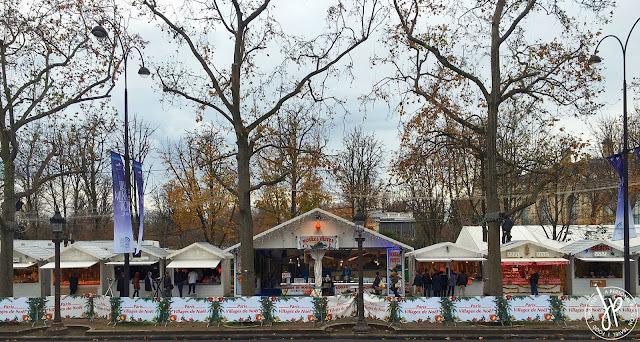 Closed book shops and souvenir stores along the Seine. They usually open midday. 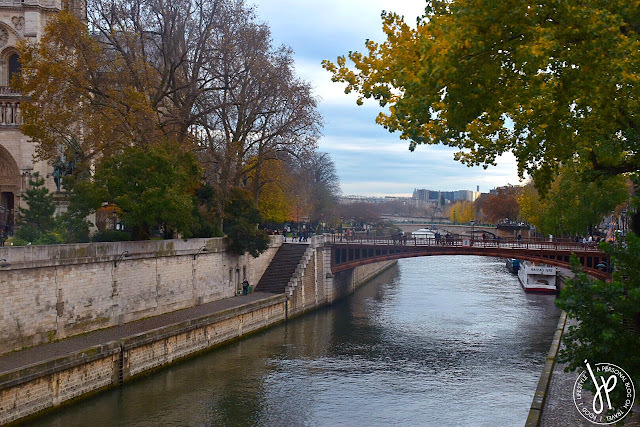 From Notre-Dame, we continued along Quai Voltaire until we reached Museé d’Orsay. I’ve always wanted to go inside this museum because of one episode in Gossip Girl where Blair Waldorf meets Prince Louis of Monaco. Feeling it wasn’t time to alight the bus yet, we stayed and proceeded towards Place de la Concorde and Champs-Élysées. Finally reaching the Big Bus stop at Arc de Triomph along Champs-Élysées! 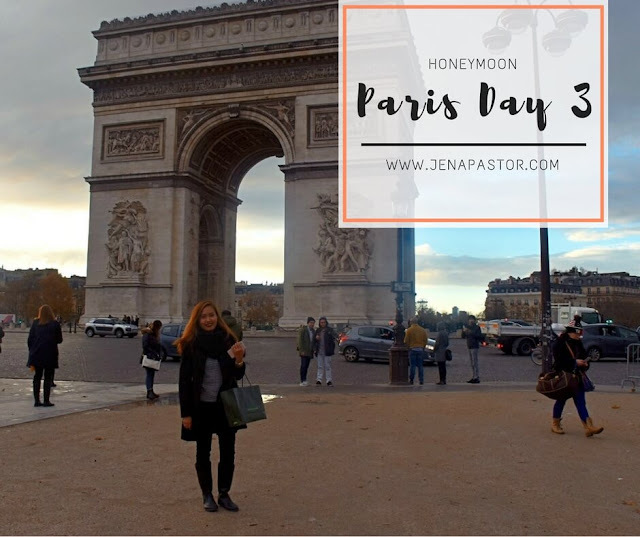 The stop at Champs-Élysées was the longest one and despite the gloomy weather, a lot of tourists still swarm this shopping avenue and the must-see attraction Arc de Triomphe. 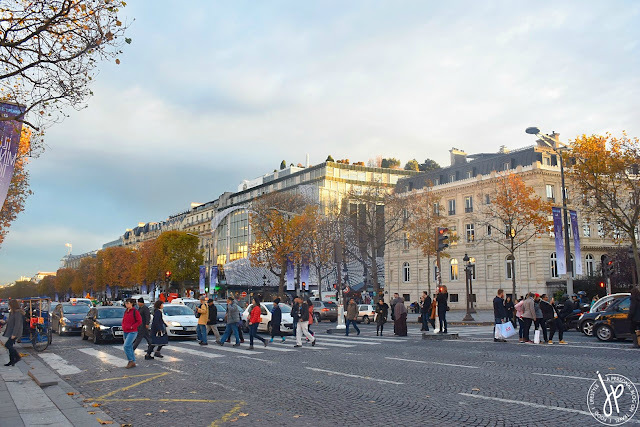 Champs-Élysées is a shopaholic’s dream destination, so I was so thrilled to spot stores which I wanted to visit later on in the day! 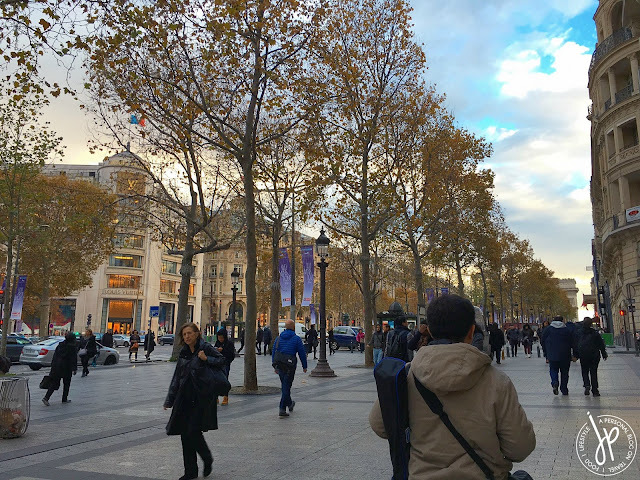 I was also pleased that there was free wifi along Avenue des Champs-Élysées, so it took away the boredom in between audio gaps and from waiting too long at the bus stop. 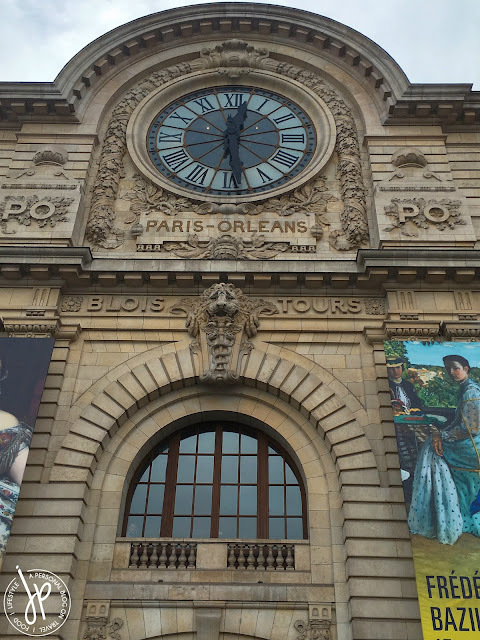 Moving on, the bus travelled to Grand Palais which is a huge exhibition hall and museum complex. 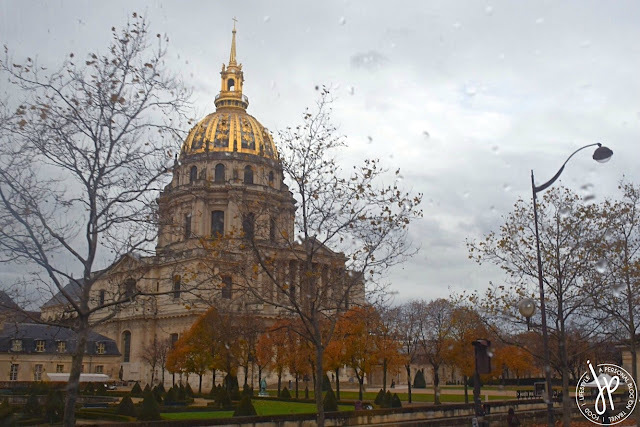 It’s also one of the grandest architectural structures in Paris which isn’t hard to miss because of its grandeur presence and glass ceiling panels. 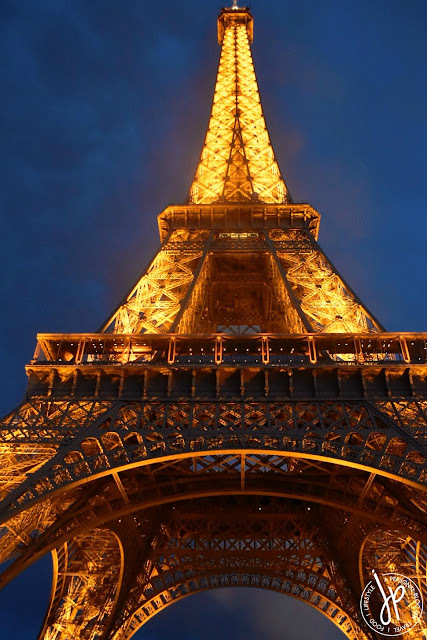 The next stops were Trocadéro and Tour Eiffel, which are popular destinations to have photos taken with the background of the Eiffel Tower. 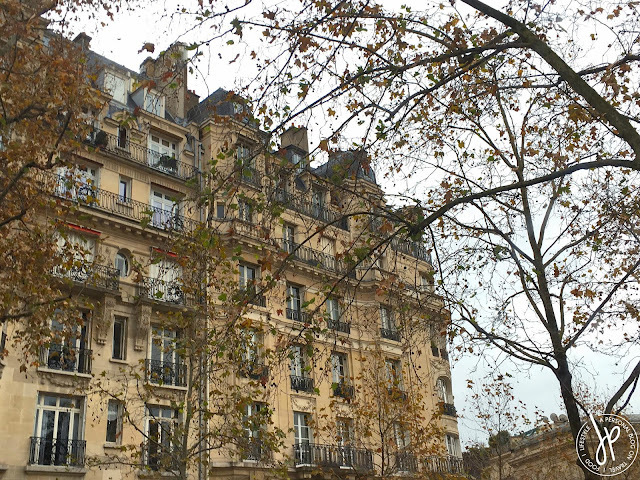 Typical residential apartment buildings in Paris, some of which were turned into hotels. Musée Rodin and The Thinker (Le Penseur), a sculpture of Augustine Rodin representing philosophy (man in deep thought). 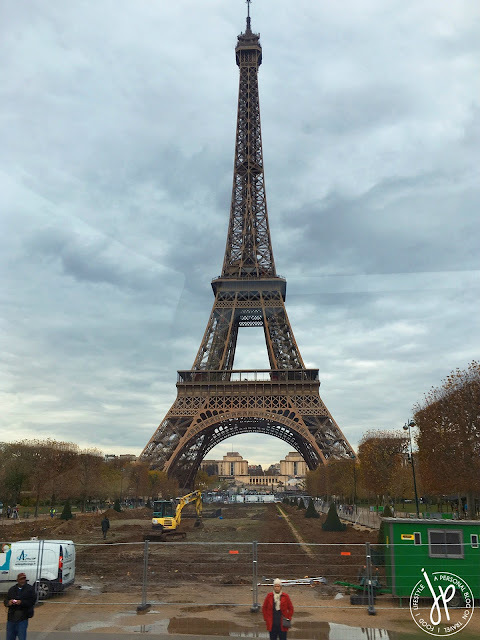 Champ de Mars park is also a great place to have Eiffel Tower photos taken, though it was under construction last November. During spring and summer, many tourists plant their blankets on the grass to have picnics or bask under the sun while reading a book. 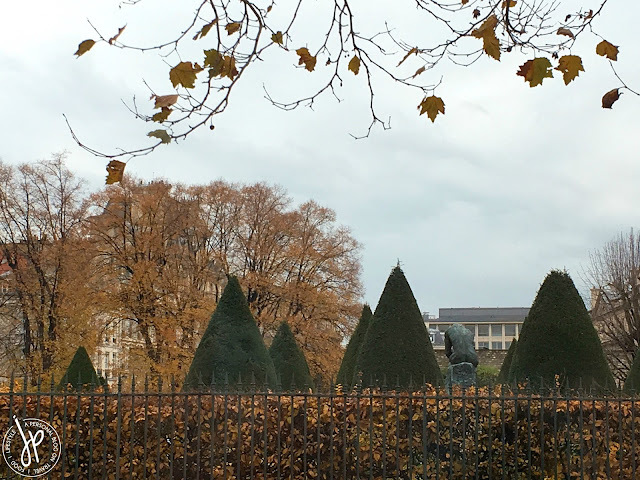 The bus also passed by this park before snaking its way to Les Invalides, comprising of France’s military museum, monuments, and home to war veterans. 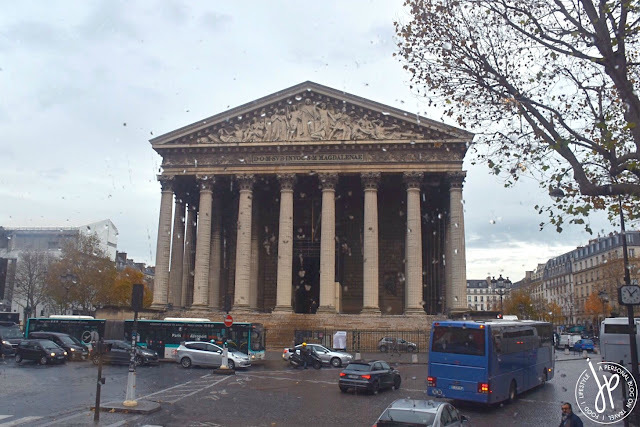 L'église de la Madeleine (or La Madeleine in short), a Roman Catholic church in a temple style structure. Pont Alexandre III deck arch bridge over the Seine that connects Les Invalides, the Eiffel Tower, and Champs-Élysées. 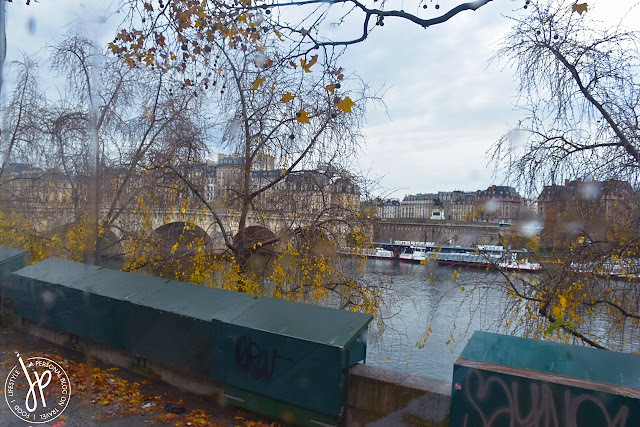 It is known to be the most extravagant bridge in Paris. 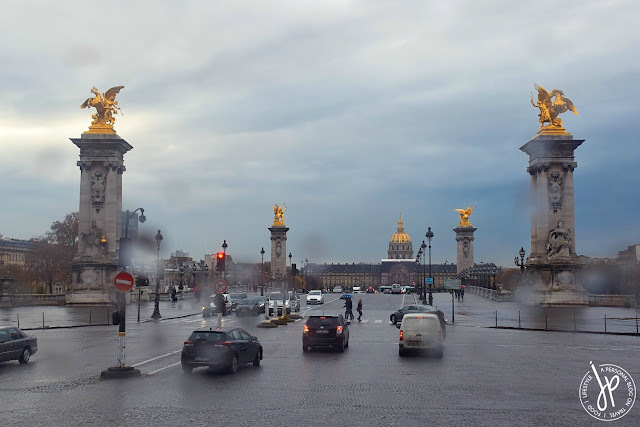 We passed by Place de la Concorde once more until we reached the stop for Opéra Garnier (also known as Palais Garnier), which is home to Paris’ opera and ballet. 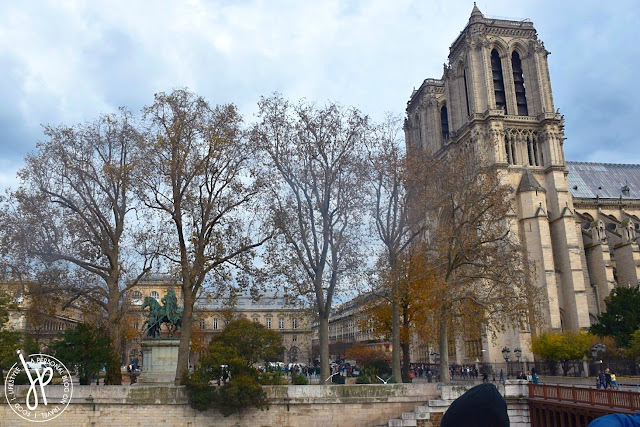 I don’t remember if there was a ballet recital during the time we visited, but I’d love to watch one the next time I’m in Paris. My husband and I had to hop-off the bus at this stop because I had the very strong urge to pee. Luckily, Galeries Lafayette was just a few steps away so I took the opportunity to run to the toilet. 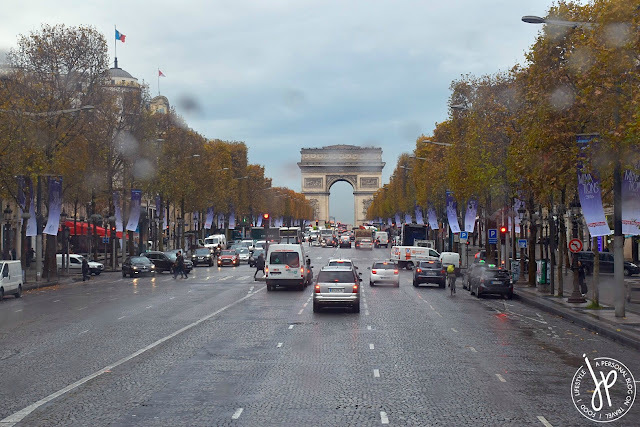 After the short trip to Galeries Lafayette, we hopped on another Big Bus Paris tour bus and proceeded with our journey. 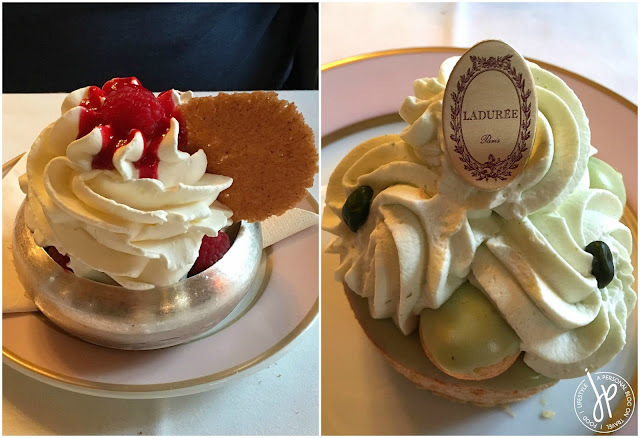 It was a bit of a long trip, but I managed to persuade my husband that we have our late lunch at Ladurée along Champs-Élysées. 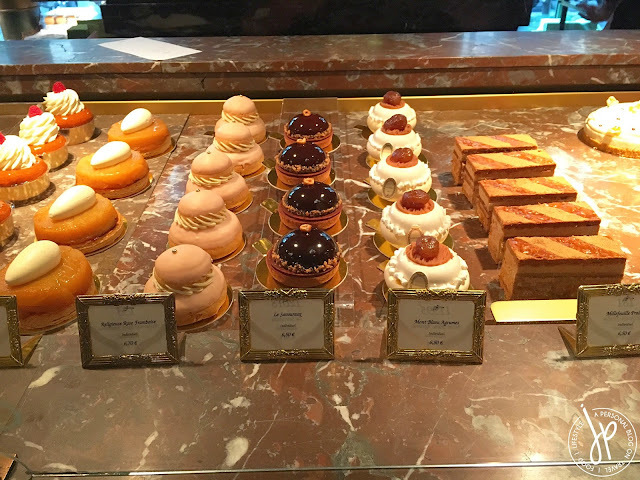 Normally it is recommended to make a reservation here because the queue outside this upscale Parisian bakery and tea salon could be very long. But because we visited during off-peak season, we immediately got a table for two at the second floor. 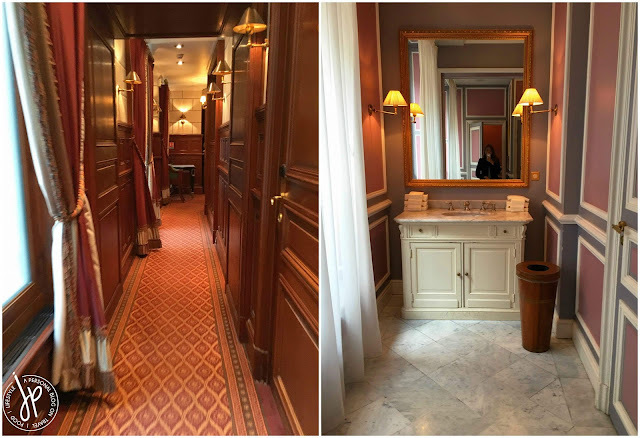 If you’re coming in for afternoon tea or dessert, the staff would find a spot for you at the ground floor facing Champs-Élysées (and this area becomes very crowded easily because you get the best views of the avenue). 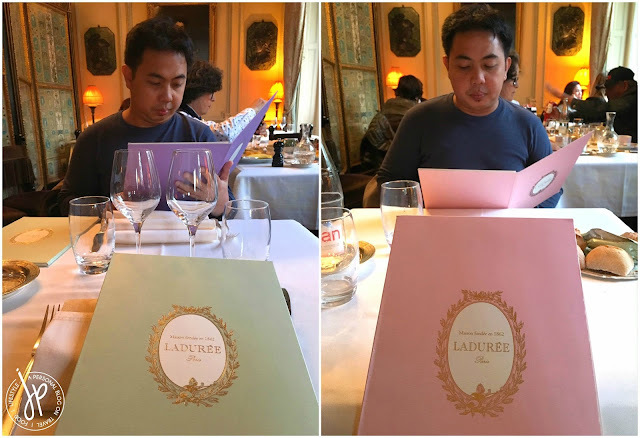 Ladurée Menus: Pastel Green and Purple for Lunch/Dinner meals and Pastel Pink for dessert. Entering this pastry shop and restaurant was truly a remarkable experience. 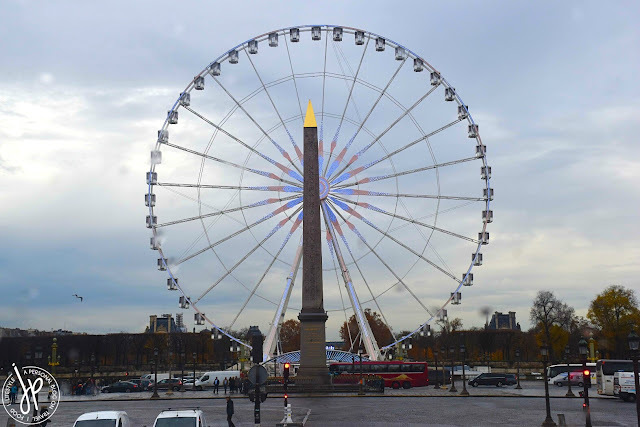 It’s very well known in Paris since its inception in 1862. The space is just opulently decorated with gold, paintings, and crystal chandeliers. 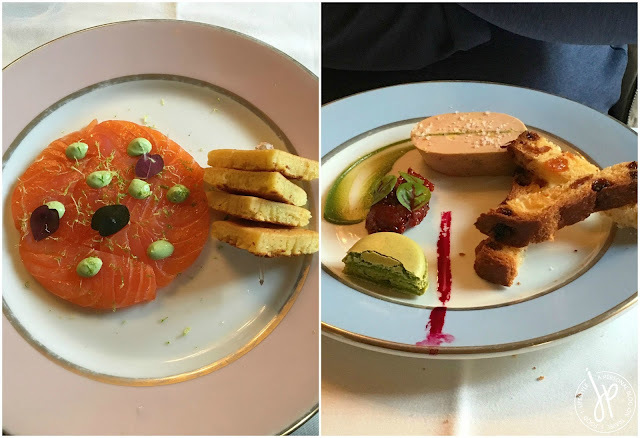 The menu was prepared in classic, sophisticated style, and to be honest, it took a while for me to pick a dish that I like. Since it’s our first time, we’d like to maximize our choices so we ordered a three-course meal that included an appetizer, main course, and dessert. 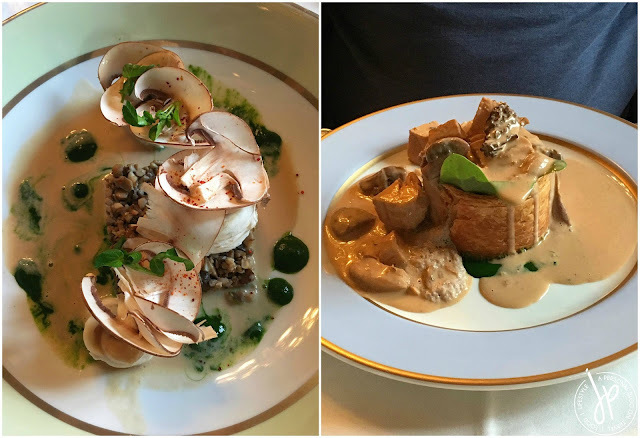 Main Course: (Left) Black Sea Bass served with mushrooms and fresh watercress; (Right) Organic chicken breast "Vol-au-vent" with wild mushrooms. Dessert: (Left) Coupe Plaisir made with raspberry sorbet, vanilla ice cream, fresh raspberries, and whipped cream; (Right) Pistachio dessert with whip cream and soft and fluffy pastry. 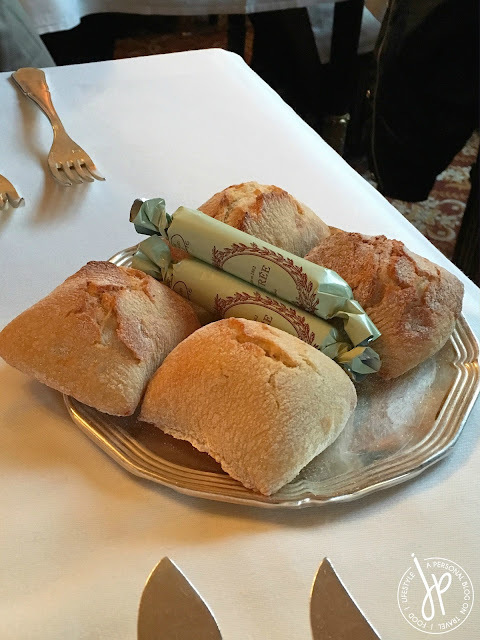 The server provided us with rolls and wrapped butter, though I got to be honest, we barely touched this. The bread was as hard as stone. Thank goodness the rest of the dishes were superb! The plating, presentation, and taste – they all met my expectation. Of course, price-wise it was very expensive for six types of dishes, but my husband and I loved everything served on our table. 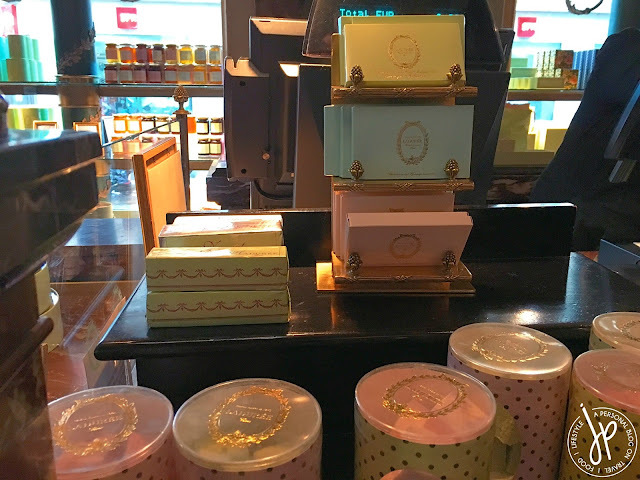 Prior to visiting Ladurée, I read mixed reviews about the food, but I was so grateful we didn’t have any terrible experience food-wise. I just had to agree with other comments that the servers were a handful of snobs (at least for the girl assigned to us). Not sure if they were trained to be that way – I just regretted leaving a tip after we ate. 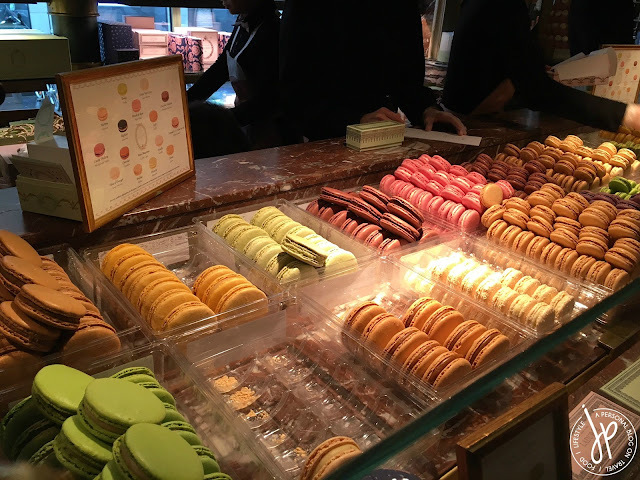 After a sumptuous meal, we headed downstairs to pick up French macarons. I believe this is the busiest part of Ladurée because tourists line up to get their hands on the bakery’s most-coveted macarons and pastries. I got myself two, half-dozen boxes (Napoléon gift box in pastel green and pink), though I must admit I no longer remembered all the flavors I picked. All I know is that my favorite was pistachio. When in Champs-Élysées, it’s hard not to peek into stores and do a little bit of shopping so I ended up buying a Christmas present for my mother at Longchamp (just a few seconds away from Ladurée). On the opposite side of the road, my husband knew where I was headed. Sadly I walked out of Sephora with nothing, but just a minute on foot from it was MAC Cosmetics where I got myself a pot of Soft Ochre. 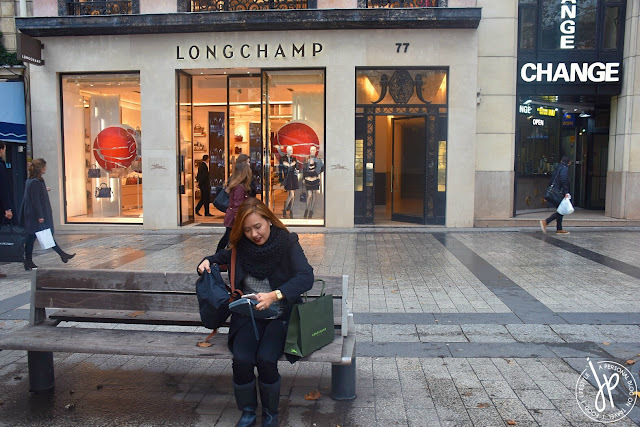 Securing my belongings after shopping at Longchamp. 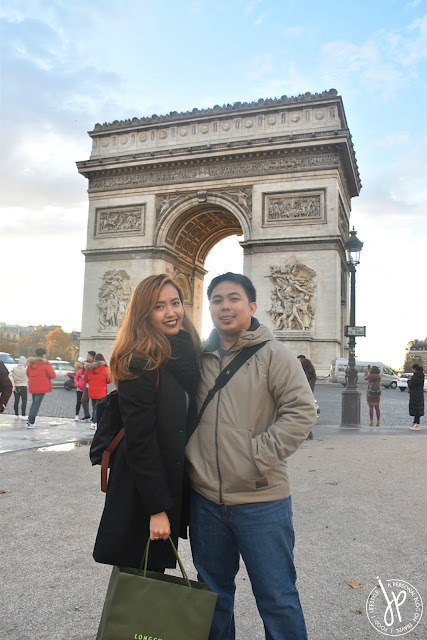 We walked towards Arc de Triomphe and did a little bit of touristy picture taking before riding the bus again. 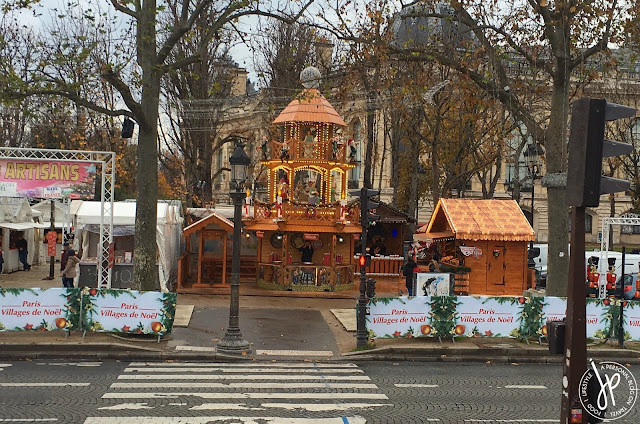 Our next destination was the stop at Trocadéro, a square with a fantastic view of the Eiffel Tower. We spent around 30 minutes here, braving the cold, just so we could see the tower light up and to take home photos as our memento. To be honest, I would’ve stayed here longer and spend some quiet time with my husband, but the weather was just unforgiving. We'll always have Paris. Je t'aime, mon amour. The Eiffel Tower even more commanding at night. 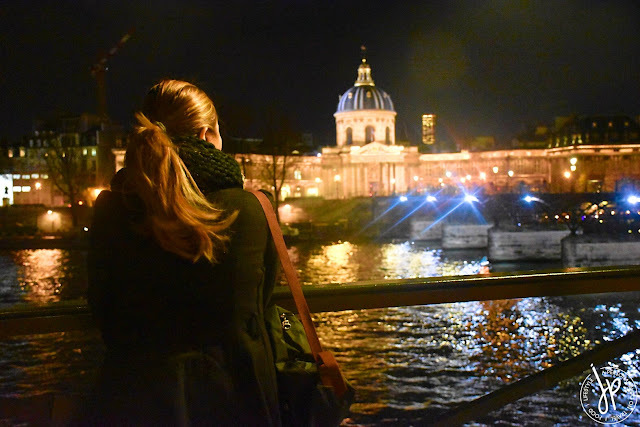 Feeling cold and tired, we called it a night and rode the bus once more heading back to Pont des Arts, wondering which beautiful corner in Paris we’d discover the next day.